Digital Signature: POPELER SYSTEM, S.L. 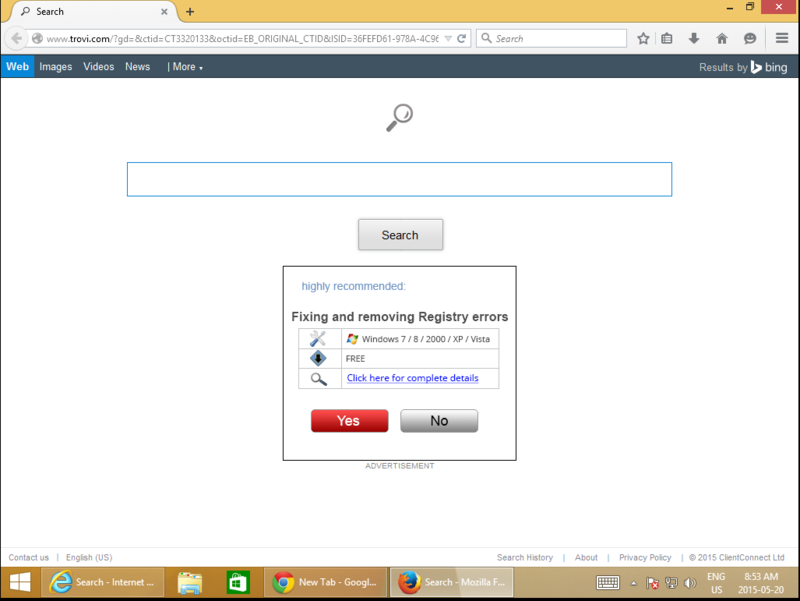 Recommended: Download Spyhunter to remove Solimba and other PUPs (Potentially Unwanted Programs). Solimba PUP is all about the ads. Once this executable is installed, it penetrates your computer system and sends ads all over your Internet Browser – Chrome, Internet Explorer, Mozilla Firefox and the likes. For this assessment of Solimba.exe PUP, two installations were carried through. In layman term, I actually installed Solimba on two occasions to decipher the true nature of the PUP. It was shocking to find that both installations revealed different bundled programs and advertisements. In the first instance (as shown below), Solimba proved more aggressive in featuring ads for revenue advancements. Image 1: It’s important to note that the image shown above is the hijacked results resulting from the installation of Solimba. This affected the results of the website on the Internet browser to boost its ranking, even without the use of a search engine. The advertisement displayed on the Internet Explorer search page routes the user to a software installation website. 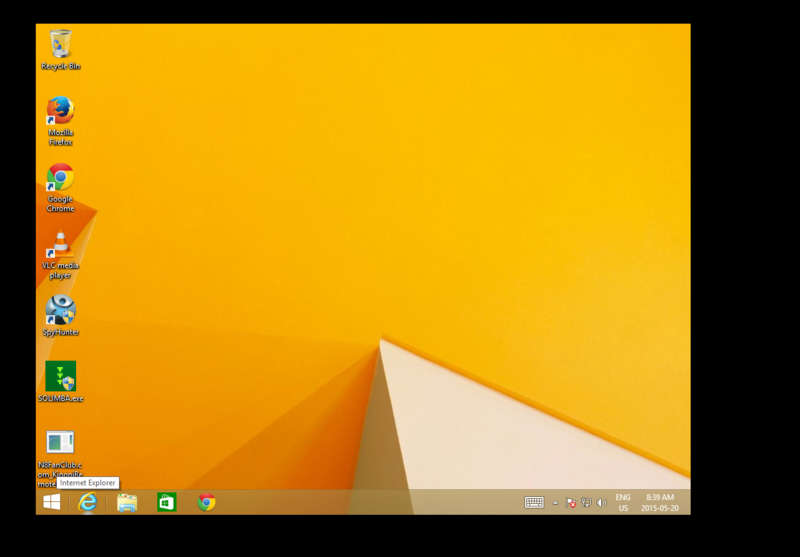 The utility tool in question was a “Windows 8.1 PC Repair” tool used to identify threats present on the Windows 8.1 OS. Image 2: As in the image shown above, a similar ad was displayed. 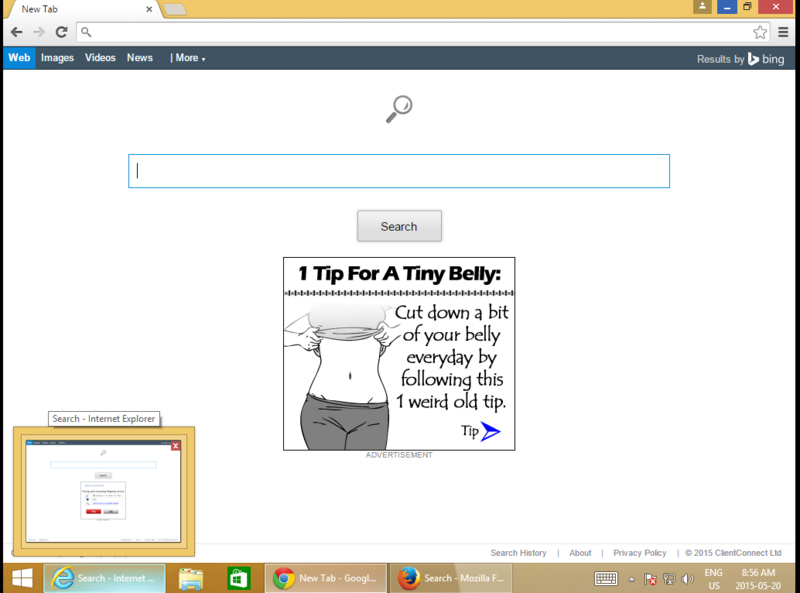 When clicked, the same utility tool webpage was shown. Image 3: The advertisement displayed on the Chrome Browser search page routes the user to a health and beauty magazine website. This site advocates health and beauty, especially issues concerning weight loss. Several ads were visible on site, displaying products to assist people in losing weight. During my installation of Solimba, the installation wizard underscored that four programs would be downloaded. These programs included N8Fanclub.com_KinoniRemoteDesktop, Lolliscan, PaceItUp, and SearchProtect. Interestingly, only two programs from the list were apparent or obvious. 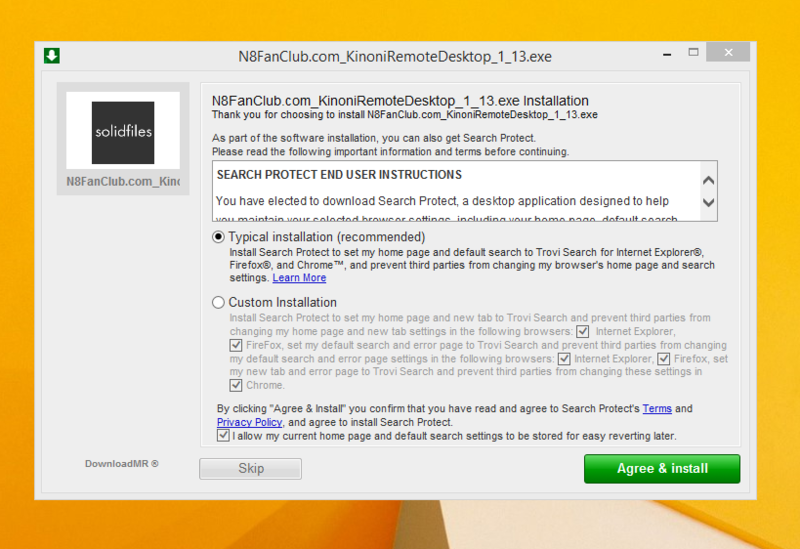 An N8Fanclub.com_KinoniRemoteDesktop file was made on the Desktop and SearchProtect was seen in “All Programs”, along with files stored on the computer’s Local Drive. 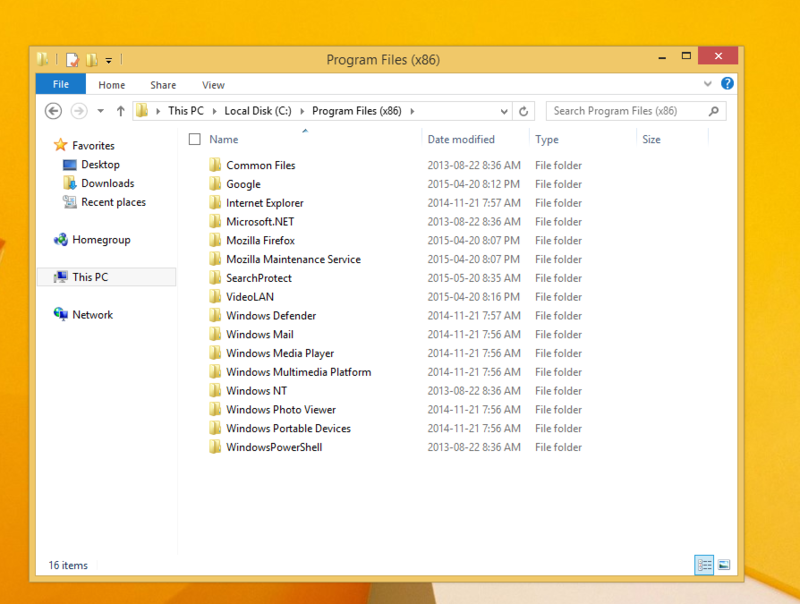 The other programs that were “supposedly” installed remained concealed. A test was done to determine whether these were counted as extensions or add-ons to the varying web browsers but nothing was found on any of the tested browsers – Google Chrome, Internet Explorer, and Mozilla Firefox. Image 4: A total of four (4) programs were installed as a bundle after Solimba installation. 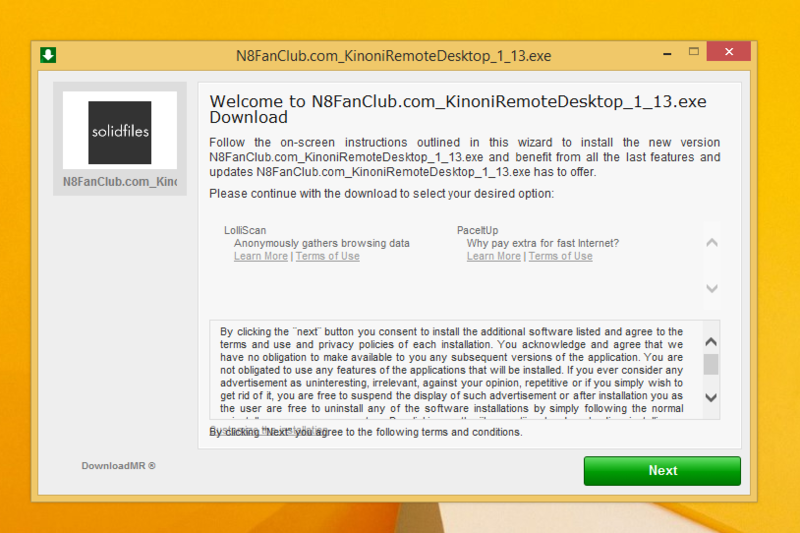 N8Fanclub.com_KinoniRemoteDesktop: When this file was initially found on the Desktop, a root kit came to mind. A root kit was used as a means to an end. Whoever was on the receiving end of this unwanted file would be able to connect to an infiltrated system without the knowledge of the user. After running the file to determine its behaviour, nothing much happened. A message appeared indicating that the software couldn’t execute on the computer. That was pretty tricky since to begin with, I didn’t place that specific file on the desktop but it came along with the territory and so I had to accept it. Further research online into N8Fanclub.com_KinoniRemoteDesktop proved very rewarding. A search of the entire file name was not able to do the trick so I had to do a research on both terms separately. After landing on N8Fanclub.com, I was nicely asked to disable my ad blocker. Image 7: Messaging requesting that I disable ad blocker on my computer. There seemed nothing harmful about the site. 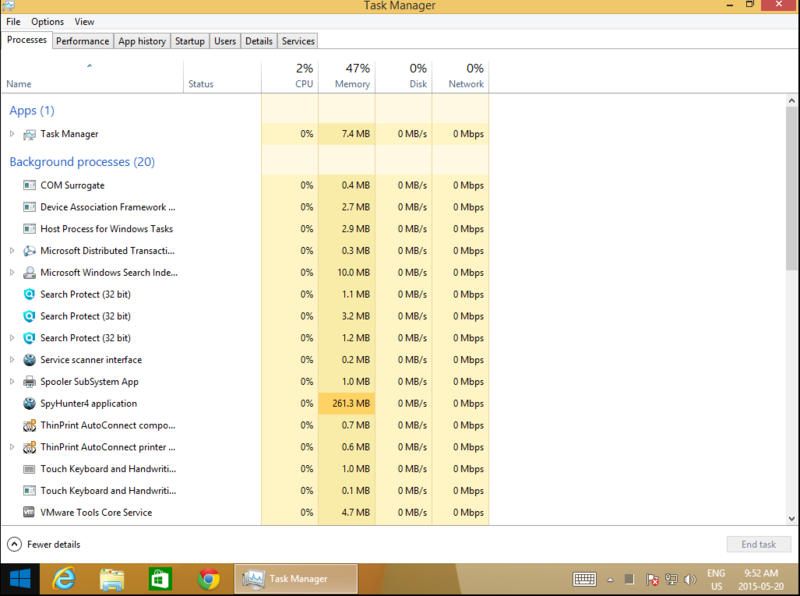 However, due to the fact that it was not what I initially installed, the program was an unwanted program. That’s exactly what Solimba does. It installs several other programs that were not requested by the user in an attempt to make money from advertising. The mere fact that this program got installed meant that it was to promote an online service. KinoniRemoteDesktop was a separate program. It was combined with N8Fanclub as a way to allow users to use their PC computer “as if they were sitting in front of it.” A user would be able to make use of a full web browser, watch Flash videos, play games and even use office applications. This would be done from the user’s Nokia device. This is advertisement at its best. Lolliscan: This program did not allow me to see much since it didn’t leave a physical trace behind. However, during the installation, Lolliscan was listed as one of the four programs that would be installed. Overall, Lolliscan supposedly should be able to save people money since this form of ad focuses on showing coupons, when visiting sites such as Amazon. While this seems like a good deal, this ad will invade your personal space and distribute pop-ups at the most inopportune times. PaceItUp: As the name states, PaceItUp is a software added to a browser with the intent to speed your computer. Quite the contrary, PaceItUp does the total opposite since it installs bundled programs which slow down a computer system. PaceItUp is also known for displaying ads and tracking what the user does on his/her computer system. It’s known for hijacking your computer’s homepage. In fact, this addition is very stubborn and often possesses a challenge when a request to uninstall is made. The second installation of Solimba also had its own dose of bundles to display. 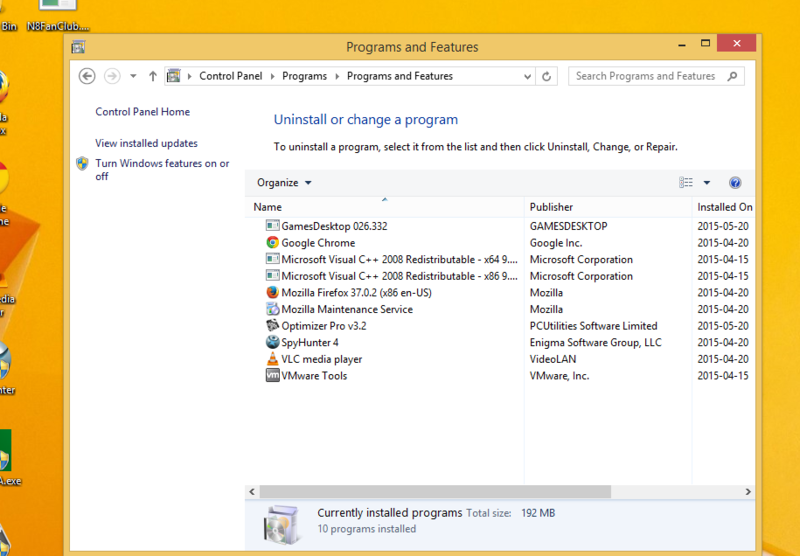 In comparison to the first installation, two programs from the bundle were different while two remained the same. The image below illustrates that. As revealed in the images, two additional programs were installed along with the second installation of this bundle. SearchProtect and N8Fanclub.com_KinoniRemoteDesktop remained triumphant and unbeatable. They were repeated within the installation. Optimizer Pro and GamesDesktop installed after second installation. Image 10: As revealed in the images, two additional programs were installed along with the second installation of this bundle. These were dubbed Optimizer Pro and GamesDesktop. SearchProtect and N8Fanclub.com_KinoniRemoteDesktop remained triumphant and unbeatable. They were repeated within the installation. 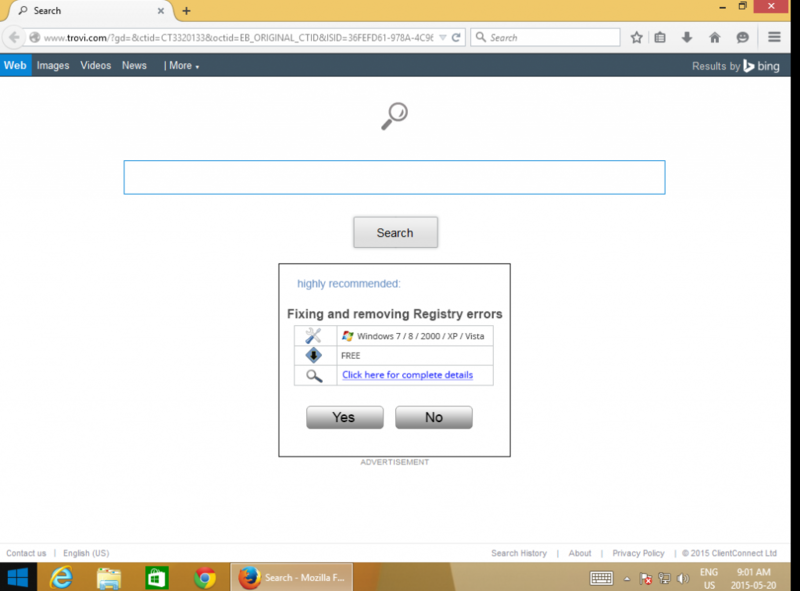 To completely remove Solimba from your computer, click here to download and install Spyhunter.